Ubisoft is the play on videogames. Shares of Activision Blizzard (ATVI - Get Report) closed at $66.82 on Thursday, a 2.3% decline from Wednesday's close. The stock had been as much as 6% lower after the accidental leak, and prior to the trading halt. The villain, if you're an investor in, or a fan of Activision would be the free-to-play game "Fortnite Battle Royal," an Epic games product. This is a game, where most of the planet's population is wiped out and the players are pitted against the backdrop of a zombie apocalypse. Fortnite has taken gamer attention away from publishers attempting to monetize the business. Where did the money raised by my previous sales in Activision go? 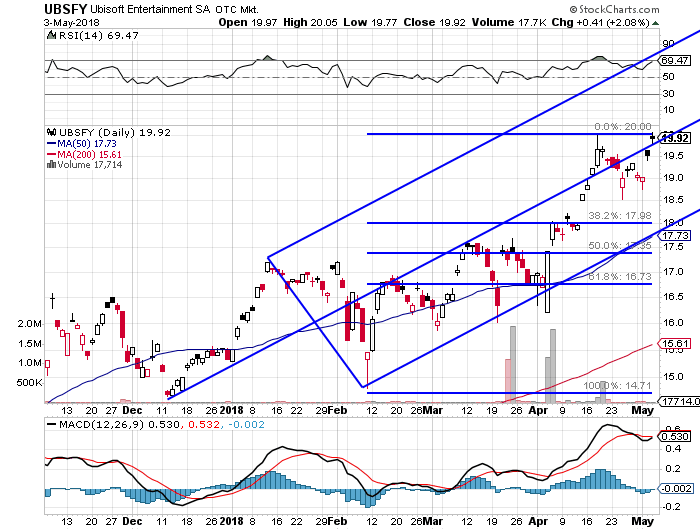 While I have been raising cash -- you all know that -- I have also been building a long position in the ADR of Ubisoft Entertainment SA (UBSFY . This cute little thing trades on the pink sheets, and has been on the rise, while other video game publishers have been a little wobbly. Ubisoft is a French gamer company headquartered in Montreuil, France, not to be confused with Montreal, Quebec. This firm has subsidiaries all over the world, and you know their titles. How about "Assassin's Creed," "Prince of Persia," "Far Cry," and the Tom Clancy names. Yup, all these are theirs. Actually, in terms of revenue and market cap, this firm is fourth place in the Americas and Europe, behind Activision, Electronic Arts (EA - Get Report) , and Take-Two Interactive Software (TTWO - Get Report) . I am only long about 20% of what I would like to be long in Ubisoft. The name ran on me over the past month, and the position is up a welcome 17.3%, but this move happened prior to the implementation of my full long. "Far Cry 5," the most successful Far Cry game has been the catalyst for this recent pop. The $20 level is where this light trader potentially breaks out. We see a take and a hold there; I think we can see $22.50 or $23. A failure here, and the panic point comes in between $17.75 and $18, literally the difference between the 50-day simple moving average (SMA) and a 38.2% re-tracement from the top of this chart.